Palm sugar is a sweetener derived from any variety of palm tree. Palm sugar is sometimes qualified by the type of palm, as in coconut palm sugar. While sugars from different palms may have slightly different compositions, all are processed similarly and can be used interchangeably. The predominant sources of palm sugar are the Palmyra, date, nipa, sugar and coconut palms. The Palmyra palm (Borassus spp.) is grown in Africa, Asia, and New Guinea. The tree has many uses, such as thatching, hatmaking, timber, use as a writing material, and in food products. Palm sugar is produced from sap ('toddy') from the flowers. The date palm has two species, Phoenix dactylifera and P. sylvestris, and both are sources of palm sugar. P. dactylifera is common in the Mediterranean and Middle East. P. sylvestris is native to Asia, mainly Pakistan and India. Date palms are cultivated mainly for dates. Palm sugar is made from the tree's sap. The nipa palm (Nypa fruticans) is native to the coastlines and tropical regions of the Indian and Pacific Oceans. It is the only palm tree that grows in a watery mangrove biome. Only its leaves and flowers grow above water. Palm sugar is made from the sugar-rich sap. The sugar palm (Arenga pinnata) is native to the coastal and tropical regions of Asia, mainly China and Indonesia. The sap used to produce palm sugar is known in India as gur and in Indonesia as gula aren. The coconut palm (Cocos nucifera) yields coconut palm sugar from the sap of its flowers. It grows in coastal areas of the Indian and Pacific Oceans. Major suppliers are Thailand, Indonesia, and the Philippines. Palm sugar is produced by boiling collected sap until it thickens. The boiled sap can be sold as palm syrup. It is sold in bottles or tins and tends to thicken and crystallize over time. The boiled sap can also be solidified and sold in the form of bricks or cakes. It can range in color from golden brown to dark brown or almost black, like Indonesian gula aren. Palm sugar is an ingredient in both sweet and savoury dishes used throughout Asia, the Middle East and North Africa. Palm sugar is known in many names and many variants, depends on its ingredient, production method, or the region. It is known as gula jawa (Javanese sugar) in Indonesia, and gula melaka in Malaysia. There is specific difference on palm sugar naming in Indonesia; if it is made from coconut, it is called as gula jawa or gula merah (red sugar), on the other hand gula aren (aren sugar) refer to palm sugar that specifically made from the sap of aren palm flowerbuds. Gula jawa has an earthy aroma and deep sweetness with a darker color closely resembling molasses, while gula aren has paler color. Gula melaka is a type of palm sugar made from the sap of flower buds from the coconut palm or, less commonly, other palms. It can be dense and sticky. It is known in English as "malacca sugar", probably because it originated in the state of Malacca, Malaysia, which is called "Melaka" in Malay. Traditionally, gula melaka is made by first extracting the sap from the flower bud of a coconut tree. Several slits are cut into the bud and a pot is tied underneath to collect the sap. The sap is then boiled until it thickens. Next, the sap is poured into bamboo tubes 3–5 inches (7.6–13 cm) long and left to solidify to form cylindrical cake blocks. Due to the labor involved in production it is often more expensive than the ubiquitous caster sugar. It is used in some savoury dishes but mainly in the local desserts and cakes of the Southeast Asian region. Gula melaka sago pudding is a dessert made with gula melaka and a common hot or cold dish of Peranakan (Chinese–Malay) origin. 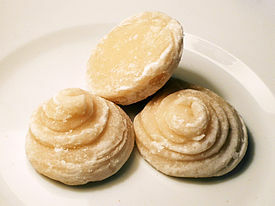 Other examples include chendol and ondeh ondeh, a ball-shaped dessert made from glutinous rice flour, filled with gula melaka, and covered in shredded coconut. ^ "Palm Sugar in Germany" (PDF). Import Promotion Desk (IPD). CBI, Ministry of Foreign Affairs, The Netherlands. Retrieved 6 July 2017. ^ Vaughan, John; Geissler, Catherine (2009). The New Oxford Book of Food Plants. OUP Oxford. p. 107. ISBN 9780191609497. ^ Borin, Khieu (1998). "Sugar palm (Borassus flabellifer): potential feed resource for livestock in small-scale farming systems". FAO World Animal Review. 91. ^ Dalibard, Christophe (1999). "Overall view on the tradition of tapping palm trees and prospects for animal production". FAO Livestock Research for Rural Development. 11 (1). ^ Eckhardt, Robyn (2017-01-10). "Confessions of a palm sugar addict". Saveur. Retrieved 6 July 2017. ^ Kitchen, Leanne (2015-07-14). "10 ways with palm sugar". Special Broadcasting Service (SBS). Australia. Retrieved 6 July 2017. ^ Heine, Peter (2004). Food Culture in the Near East, Middle East, and North Africa. Greenwood Publishing Group. p. 58. Retrieved 6 July 2017. ^ a b "Gula Jawa- Indonesian Palm Sugar or Red Sugar". Asian Fusion. 2010-10-15. Retrieved 2018-12-13. ^ a b "Coconut Sugar (Gula Jawa, Gula Merah) | Indonesia Eats | Authentic Online Indonesian Food Recipes". Retrieved 2018-12-13. ^ a b Eckhardt, Robyn (January 10, 2017). "Confessions of a Palm Sugar Addict". Saveur. Retrieved April 22, 2017. ^ a b c Loh, A. (2015). Malacca Reminiscences. Partridge Publishing Singapore. p. 254. ISBN 978-1-4828-5489-3. Retrieved April 22, 2017. ^ Wee, S. (2012). Growing Up In A Nyonya Kitchen: Singapore Recipes from my Mother. Marshall Cavendish International (Asia) Private Limited. p. 38. ISBN 978-981-4435-00-0. Retrieved April 22, 2017. ^ Sri Owen's Indonesian Food. Pavilion Books. 2014. p. 309. ISBN 978-1-909815-47-6. Retrieved April 22, 2017. This page was last edited on 13 December 2018, at 11:51 (UTC).